"If you forget everything else, remember the most important fact about this planet: Mars has a million ways to kill you." Lieutenant Mpondo swept his gaze over the twenty new arrivals. Sean Doe, in the fourth and last row, met his dark brown eyes without smiling, nodding, or blinking. Sean was over fifteen years old, and for most of that time people had been trying to kill him. Sean and the nineteen others -- all of them adults -- sat strapped in, since the Argosy was still in space and they were weightless. Mpondo, a man of twenty-five with his hair cropped to a shadow on his skull, hovered with his feet just off the deck, a wall belt looped around his waist to keep him from drifting. He wore the orange uniform of the Interplanetary Service. It was the worse for wear, but after more than a year of traveling, the same could be said for everyone's clothes. Mpondo opened a panel and pressed a button, and the viewport, a ten-foot square 3-D screen, cleared to give them a view of space. And of Mars, closer than ever before. The ruddy reddish-orange disk nearly filled the viewport. The hemisphere of the planet that Sean could see lay in full sunlight. Mars looked like a ravaged world, all her blemishes showing: long shadowed cracks that were really canyons deeper than any on Earth, impact craters, a south pole ringed with an icy white cap, blurred haze. Someone in the front row murmured and pointed as a falling meteorite sketched a brilliant line across the planet near the polar ice cap. "Just a delivery," Mpondo said in a loud voice. "That's ice, coming in from the robot mass driver on Jupiter's moon Ganymede. Approx-imately twice a day the mass driver fires a projectile of compacted ice in an orbit that whips it around Jupiter and sends it to Mars. After a journey of years, the projectile comes into the Martian atmosphere within twenty degrees of the south pole -- yes?" A man in the row ahead of Sean had his hand up. "How big are these things?" he asked. "On Earth they would mass about twenty-five tons," Mpondo replied, looking mildly irritated at the interruption. "And to answer your next question, they pose no threat to Marsport. They don't come anywhere near the base. Their orbits bring them in at a shallow angle over the south polar regions, where they mostly evaporate -- because of the heat of entering the atmosphere -- before they even reach the surface. They've been crashing into the Martian atmosphere for more than thirty years now, adding water, carbon dioxide, and other gases to the planet. As a result, the Martian air is growing denser. One day it will be rich enough in oxygen to allow you to breathe on the surface, and thick enough to hold the sun's heat. But that day's a long time off." Sean could make out cloud patterns in the atmosphere of Mars, swirls and sweeps of pale color, and he noticed now how the edges of the planet blurred to blue haze against the darkness of space, unlike the sharp lines of Luna, the Earth's airless moon, where he had trained for the trip to Mars. Mpondo was holding up a finger. "Right now, if you tried to breathe the atmosphere on Mars, it would kill you." He held up another finger. "Right now, if you took an unprotected stroll outside of Marsport, you would freeze to death. Right now, if Marsport didn't receive regular resupply from Earth, the colonists would starve. I could go on, but I think that makes the point. Mars is a deadly world." A new world, though, Sean thought. He felt strange just contemplating his trip -- no, his escape -- from Earth. His chest tingled as he reflected on being among the first humans to live on a different planet from Earth, from the homeworld. So Mars was deadly? So what? Bring it on. Sean could not remember his parents. He could barely remember his rescue. He was one of a dozen survivors of the Aberlin tragedy, an act of biological terrorism that had erased a small Scottish town from existence. They told him he had been two when the attack happened. He vaguely remembered the American team that had found him and had flown him, isolated, across the Atlantic. He remembered the endless stream of doctors who had jabbed and bled him, X-rayed and imaged him, tested and prodded and poked him, trying to learn why he had lived when hundreds of others had died. He was a specimen to them, nothing more. John Doe. When he had learned what that meant, a generic term for an unknown, he had changed it just enough to make it his own: "Sean" was Scottish for "John," and so he had become Sean Doe. The government had placed him in a foster home, and within a month he had escaped from it. For three years he had survived in the urban jungle of Deep New York, where gangs of young thugs faced down everything law enforcers could throw at them. And he had survived. At eleven, he was illiterate, underweight, and sick with half a dozen diseases of poverty. Then Dr. Simak had tracked him down at last. Of all the doctors who had examined him, Dr. Amanda Simak was the only one that Sean had halfway trusted. And, as it turned out, she was the only one who seemed to care whether AVS-3 lived or died. She had found him in a burned-out storefront, wounded and ill, and had taken him, not to a hospital or to an institution, but to her home. She had treated his wounds and his sicknesses, had taught him to read, had learned how intelligent he was. More importantly to Sean, she had legally adopted him. Sean could remember that period of seventeen months, from the middle of his eleventh year to his thirteenth, as an interval of security in a life of danger. For the first time in his life, no one had been trying to hurt him. For the first time in his life, he had trusted an adult. And then she had broken the news one morning while they sat on a jumble of boulders overlooking the stream that flowed near her home in the mountains. "Sean, I'm going away." He had not protested, and he had not cried. He had never cried in his life. "Where?" She had pointed up into the blue sky of Earth and smiled. Amanda Simak was forty-two, a tall woman, with light brown hair and a plain, thin face made lively by the bluest eyes Sean had ever seen. "Mars." She had shaken her head. "Not yet. You're too young. But when the time comes -- "
She took one of his hands. "Not another foster home. I have friends who live in Florida. That's very different from here, but I think you'll like it. The Marsport Commission has agreed to consider sending young people to the colony, but that's in the future. When you can come, I'll send for you." And that was that. The couple in Florida, the Thomases, were much younger than Dr. Simak, and they tried their best. Sean learned to swim in the sea, and to fish and sail. They worried because he never laughed, never cried, never showed any sign of temper. But they didn't realize how little they knew about what he was feeling. Sean had a gift he could not explain or fully understand. It was a mental ability to put together trends, facts, and forces and predict what would happen. He watched the news and studied history. He learned of the forces in Old Europe, South America, Central Asia, Africa, all warring for their rights, their wishes, their desires. In his head, lines of force intersected, changed direction, grew more intense. And Sean knew something would happen in three to five years. Something terrible. He never spoke of it. After Dr. Simak had arrived to take charge of Marsport, he never told even her. Their communication was odd, to be sure. Mars was so far from Earth that it took half an hour or more for transmissions to travel from one planet to the next. Instead of conversations, they had a series of monologues. Dr. Simak would appear on the monitor, smiling, saying, "Hello, Sean. Here's the news from Mars," and then would talk for ten or fifteen minutes. When she had finished, Sean would reply for about the same length of time, then transmit. And in thirty or forty minutes, she would get his reply. But he never told her what he saw coming. They had been apart for well over a year when she sent word at last: "You can come." He traveled to Luna, Earth's moon. The colonists there called their underground warren "Lunacy," and they called themselves "Lunatics," but always with a grin. They had given Sean a crash course in Martian survival, and they had seen him aboard the Argosy for the long trip through space. Sean had never once complained. By then he knew, although he could not quite express how he knew, that for Earth, time was running out. The Argosy went into orbit a hundred miles above the surface of Mars. The new colonists flew down to Marsport in three landers sent up from the surface, each able to carry only six passengers. Sean's chance did not come until the last day, when he and five others were cleared for landing. He never got a clear glimpse of the lander he was boarding, but from his training back on Luna he knew that it was shaped something like a flattened cone. He had a window seat, and he stared out of a very small viewport as the craft dropped into the upper reaches of the Martian atmosphere. The lander turned, coming in tail-first at this altitude. Turbulence jolted and jarred him, and he heard the other colonists murmuring in tones of worry, but he held on and stared out the window. The distant landscape gradually grew closer and more distinct until they were sweeping over a chaotic world of craters, boulders, vast gullies, and wind-whipped sheets of sand. Then the lander rotated, and Sean caught his breath. He could see the immense dome of a mountain, one far larger than any on Earth: Olympus Mons, an enormous dead volcano that towered fifteen miles high. Somewhere at its base was Marsport. more like forty-three, but after the weightlessness of space, he felt as if he were wading through molasses. The passengers filed forward through a hatch into a sealed disembarkation tube, a long, slanting ramp without windows. At the far end was a corridor lighted by fluorescent panels, and at the end of the corridor Sean stepped into a dome that gave him a sense of spaciousness. It was thirty meters -- about a hundred feet -- in diameter. And two-thirds of its walls were viewscreens. He turned at once and felt his throat tighten. Dr. Simak stood a few feet away. She was wearing a light gray tunic with pockets everywhere, darker gray slacks, and black boots. Her lined face was smiling, and her blue eyes gleamed with tears. "I've waited a long time to see you again." Sean lurched toward her, nearly falling. He hugged her tightly. "I'm glad to be here," he said, his voice a rough whisper. Sean shifted in his seat. He had been on Mars for less than an hour, and now he was waiting with the other newcomers in a classroom for an orientation session. A blond girl wandered in, spotted him as the only teen in the whole group, and came to sit beside him, making herself right at home. "Jenny Laslo," the girl said, offering her hand. As Sean shook it, she frowned and asked, "What kind of outfit is that?" "It's mine," Sean said, surprised. He was wearing a dark blue V-neck shirt, baggy trousers, sneakers, and over it all his favorite leather jacket, black and very long so that it hung to his knees. Jenny, he noticed, was wearing the standard gray tunic, black slacks, and boots. He frowned. "What's wrong with my clothes?" "Well, nothing. They're just a little unusual. Not that we have a uniform or anything. So who are you?" Jenny's eyes, which were a light blue, widened. "The Sean Doe? The one Dr. Simak adopted?" "Yes," Sean said shortly. He dreaded the questions that would come next, about his real parents and how he had lost them. "Ice," she repeated. "You know -- the coolest. She's a great person. So what's your specialty?" Sean shook his head. "I don't have a specialty," Sean said. "You'll get one. Me, I'm in adaptive agriculture. You know, studying how plants and animals adapt to nonterrestrial conditions. I'll introduce you to the rest of the brat squad later. First you have to do the 'Mars will kill you' bit." "Done it already," Sean told her. "Lieutenant Mpondo on the Argosy. Twenty lectures, all of them winding up by reminding us that Mars wants us dead." Jenny tilted her head. "No, it doesn't. It doesn't care, that's all. Remember that, and you've got the most important thing spiked from the beginning. Mars doesn't hate you. It just never forgives a mistake. Simple, right?" Some of the adults who had made the flight with Sean came in and found places near the front of the classroom. Jenny jerked her head toward the door. "Ax the class. You don't need it if you're not specializing yet." Sean had been wondering how he was going to cope with another round of information about all the dangers of Mars. He grinned. "Okay." The two of them walked out with considerably more grace than the adults who were shuffling down the corridor holding on to wall rails as they tried to readjust to gravity. Sean followed Jenny down a maze of passageways. She seemed to know everyone they passed, and they all spoke to her. She finally led Sean into the biggest dome he had seen, this one a clear greenhouse more than two hundred meters across. Jenny was grinning at him. "This is ice. Well, it's water, not ice, but it's the coolest. Lake Ares." For a few seconds Sean wasn't quite sure what he was seeing, and then everything clicked. "It's a crater," he said. They stood on the edge of a body of water so calm that it looked like a sheet of glass. It was almost perfectly round. The afternoon sunlight slanting in glistened on its surface, making it a blue shimmer. "It's the only body of water on Mars," Jenny said. "Maybe one day they'll let us swim in it. Meanwhile, it's got a few fish and a great way of splashing." She sat at the edge of the water, swept a hand down and slapped the surface. In the low gravity, a spray of water rose into the air, then fell as if in slow motion. Undulating waves broke out on the surface of the lake, rolling across the water in lazy expanding circles. "Where does this come from?" Sean asked. "Ice mines," Jenny responded. "Well, not really, but that's what we call them. Mars has a pretty good store of permafrost -- water that's under the surface and permanently frozen. When Olympus was erupting, it shot out a lot of water vapor. That condensed and fell as rain -- the atmosphere used to be thick enough for that -- and the water seeped down underground. When the first engineers were making the tunnels, they hit pockets of permafrost. Later, when the Marsport project started, some of them domed in this crater and began melting the permafrost and pumping the water in to create this reservoir. It's more than thirty meters deep at the center. We haven't had to draw on it for drinking water yet. We probably will soon, because the permafrost that's within reach is about played out." Sean watched as the slow-motion waves reached the far shore, then rebounded, coming back their way. "What about the ice at the South Pole?" "The meteorites, you mean?" Jenny shrugged. "That's mostly for the sake of the atmosphere. As the meteorites evaporate, they add water vapor, nitrogen, oxygen, and carbon dioxide to the air. You know the air pressure today is thirty times what it was in 2050? In some of the rifts, the pressure's up to three hundred millibars, but that's still not much. Maybe you know that on Earth, standard sea-level pressure is one thousand thirteen millibars. Still, we get clouds all the time now. Maybe in fifty more years we'll get rain. Or snow." Sean stared out at the surface. Long shadows were creeping across the rusty red plain. The afternoon sun shone on a complex of domes, towers, and antennae. A half-dozen people in pressure suits were working out there, clearing boulders from a stretch of ground between the dome Sean and Jenny stood in and the next one. "When do we get out?" Sean asked. "Oh, you won't be able to go outside for a couple of weeks," Jenny said. "Not until you learn all about the dangers of the surface. But you can sum them up pretty easily." "I know," Sean replied solemnly. "Mars has a million ways to kill you." They looked solemnly at each other for ten seconds. Then Jenny began to laugh, and to his own astonishment, Sean joined in. Like gravity, laughing felt very strange. Good, but very strange indeed. 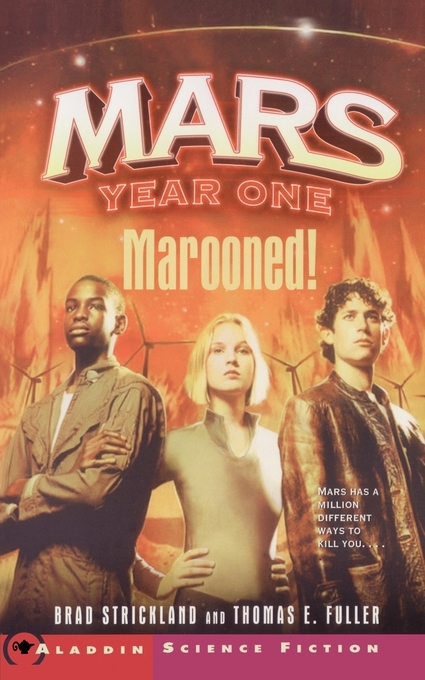 Book Cover Image (jpg): Marooned!